Built between the 10th and the 18th centuries, the Abbey of St. Peter in Montmajour is a Benedictine Monastery, originally constructed on an island 5 kilometres to the north of Arles. The well preserved architecture exudes of ancient charm and allure. The abbey also happens to be an inspiration for the many artworks of the great artist Vincent Van Gogh. The hermitage: Romanesque arches and columns make up the hermitage which dates back to the 11th century and includes St. Peter’s chapel. The cloister: Decorated with carvings of real and mythological beasts, the cloister of the abbey was built to the south of the church. Associated with each gallery of the cloister is a different story from history. The chapel of Holy Cross: Exuding simplicity, dignity and tranquillity, the chapel was built to protect the most important relic of the abbey – a piece of the True Cross. The Monastery of St. Peter: It was built in the 14th century. The Tower of Abbot Pons de l'Orme: Built in 1369 to protect the abbey from armies of French soldiers who were left unpaid after the defeat of France during the Hundred Years Wars. The Maurist monastery: Built in the 18th century, today the ruins of the monastery remain as a result of demolitions during the French Revolution. 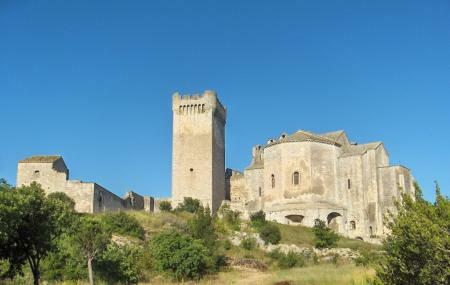 The Abbey of Montmajour shares an important piece of history and is a must visit in Arles. The last entry to the abbey is 45 minutes prior to the closing time. For a group of 20 people, ticket price is €6 per person. How popular is Abbey Of Montmajour? People normally club together Ile De La Barthelasse and Chateau D'estoublon while planning their visit to Abbey Of Montmajour. Wonderful abbey that's held in a really good state and still being renovated in some parts. Temporary expositions enhance the experience with some contemporary arts and some collaboration with the Arles photography festival. A very good and historical place to come and visit. It has been taken care of and is in really good condition for its age. Many small signs teach you about the Abbey and what it's different functions and buildings were used for. Very informative, and pricing is either free or reasonable depending on your age and nationality. 18 years and younger is free alongside of you are 26 and under and living in the EU. 6 euros per person for all others who are not free. Defiantly worth the trip if your visiting in or around Arles. Plenty of parking, which is also free, right next to the Abbey. Great place for kids. A beautiful view for the land around Arles that inspires the painter van gogh. Free entrance for European students!